In the 1860’s, an Austrian monk named Gregor Mendel introduced a new theory of inheritance based on his experimental work with pea plants. Prior to Mendel, most people believed inheritance was due to a blending of parental ‘essences’, much like how mixing blue and yellow paint will produce a green color. Mendel instead believed that heredity is the result of discrete units of inheritance, and every single unit (or gene) was independent in its actions in an individual’s genome. According to this Mendelian concept, inheritance of a trait depends on the passing-on of these units. For any given trait, an individual inherits one gene from each parent so that the individual has a pairing of two genes. We now understand the alternate forms of these units as ‘alleles’. If the two alleles that form the pair for a trait are identical, then the individual is said to be homozygous and if the two genes are different, then the individual is heterozygous for the trait. 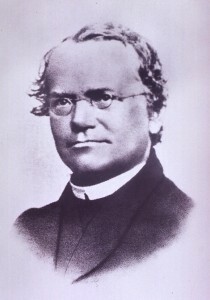 Based on his pea plant studies, Mendel proposed that traits are always controlled by single genes. However, modern studies have revealed that most traits in humans are controlled by multiple genes as well as environmental influences and do not necessarily exhibit a simple Mendelian pattern of inheritance(see “Mendel’s Experimental Results”). Mendel then theorized that genes can be made up of three possible pairings of heredity units, which he called ‘factors’: AA, Aa, and aa. The big ‘A’ represents the dominant factor and the little ‘a’ represents the recessive factor. In Mendel’s crosses, the starting plants were homozygous AA or aa, the F1 generation were Aa, and the F2 generation were AA, Aa, or aa. The interaction between these two determines the physical trait that is visible to us. 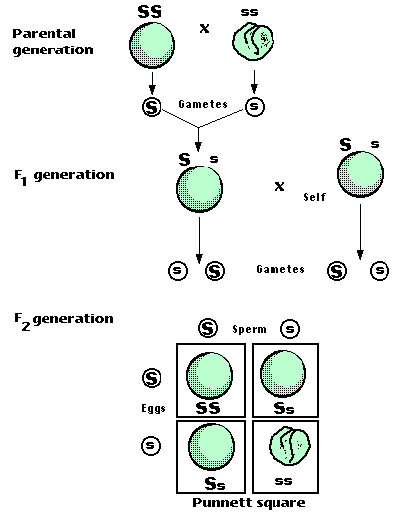 Mendel’s Law of Dominance predicts this interaction; it states that when mating occurs between two organisms of different traits, each offspring exhibits the trait of one parent only. If the dominant factor is present in an individual, the dominant trait will result. The recessive trait will only result if both factors are recessive. Mendel’s observations and conclusions are summarized in the following two principles, or laws. The Law of Segregation states that for any trait, each parent’s pairing of genes (alleles) split and one gene passes from each parent to an offspring. Which particular gene in a pair gets passed on is completely up to chance. The Law of Independent Assortment states that different pairs of alleles are passed onto the offspring independently of each other. Therefore, inheritance of genes at one location in a genome does not influence the inheritance of genes at another location. Bowler, PJ. The Mendelian revolution: The emergence of hereditarian concepts in modern science and society. Journal of the History of the Behavioral Sciences. 1990 October; 26:379-382. Castle, WE. Mendel’s Law of Heredity. Proceedings of the American Academy of Arts and Sciences. 1903 January; 38:535-548. El-Hani, CN. Between the cross and the sword: The crisis of the gene concept. Genetics and molecular Biology. 2007; 30:297-307. Mendel, G. Experiments in plant hybridization. 1865 February. O’Neil, Dennis. “Basic Principles of Genetics: Mendel’s Genetics.” Basic Principles of Genetics: Mendel’s Genetics. N.p., n.d. Web. 03 Nov. 2012 <http://anthro.palomar.edu/mendel/mendel_1.htm>.